Join Minnesota's Civil War Task Force on a trip to Tennessee, November 13-17, 2014, to retrace the steps of several Minnesota regiments and commemorate the 150th Anniversary of the Battles of Franklin & Nashville. Round-trip transportation, lodging, meals and guides all included in an affordable travel package. Contact Randal Dietrich at 651-259-3113 for more information. Space is limited. The next small grants deadline for the Minnesota Historical & Cultural Heritage Grants program is Friday October 10, 2014. Applications must be submitted via the grants portal by midnight on the deadline date. Contact the Grants Office, 651-259-3467, or Melinda Hutchinson, 651-259-3459, with questions. AASLH Annual Meeting photo and more photos! In praise of historic house museums. 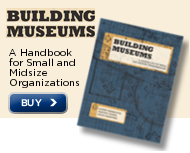 Accessible Programs in Archaeology and Museums. Meeker County Historical Museum, Litchfield MN, seeks Director. Smithsonian Institution seeks Supervisory Archivist. Waukesha County Museum, Waukesha WI seeks Education Coordinator. Pittsburg State University, Pittsburg PA, seeks Special Collections Librarian and University Archivist. Blowing Rock Art and History Museum, Blowing Rock NC, seeks Executive Director. Veterans’ Memorial Hall, Duluth MN, announces the next presentation of its History in a Pint series, “The Forgotten Theater of War During WWII,” at Carmody Irish Pub & Brewing, Thursday, September 25, 2014, 6 p.m. The event is free and open to the public. For more information call 218-733-7500. Mower County Historical Society, Austin MN, invites the public Thursday September 25, 2014, noon, for author John Christgau who will present a fascinating incident that occurred during the Civil War, one involving a runaway slave, soldiers from Minnesota, a daring rescue, and the political fallout from it all. For more information call 507-437-6082. Blue Earth County Historical Society, Mankato MN, invites you to join them Thursday September 25, 2014, 6 p.m., when Dr. William E. Lass presents on his book, "Shaping the North Star State: A History of Minnesota Boundaries." For more information call 507-437-6082. River Rendezvous, a living history event, returns to Pond Dakota Mission Park in Bloomington MN, Thursday September 25, 2014, 4 to 8:30 p.m. For more information call 952-563-8693. Isanti County Historical Society, Cambridge MN, is very pleased to announce that Red Johnson will be performing at "Sweet Sue's Music Hall" on Saturday September 27, 2014, 6:30 p.m. For more information call 763-689-4229. Historical and Cultural Society of Clay County, Moorhead MN, announces that Author Mary-Ann Kirby, an award-winning journalist and bestselling author whose lastest work is "Secrets of a Hutterite Kitchen," will be presenting at German Culture Day, Hjemkomst Center, September 27, 2014. For more information call 218-299-5511. Free to the public. Carlton County Historical Society, Cloquet MN, welcomes Cloquet native, Paul Fahlstrom, as the guest speaker for the Smithsonian Magazine "Museum Day Live!" event on Saturday September 27, 2014, 9 a.m. to 4 p.m. For more information call 218-879-1938. Rice County Historical Society, Faribault MN, would like to invite history adventurers young, old, and in between to join them on Saturday September 27, 2014, 4 p.m. to 7 p.m. for our second annual "A Night at the Museum." For more information call 507-332-2121. Minnesota Heritage Publishing invites the public to the Boys in Blue Civil War Cemetery Walk and Supper, Saturday September 27, 2014, Walk, 3 to 5 p.m.; Supper, 5 to 8 p.m. Proceeds to benefit the Boy in Blue Memorial Project. Email for more information. Blue Earth County Historical Society, Mankato MN, invites you to join them for their Open House and Member Appreciation, Saturday September 27, 2014, 10 a.m. to 4 p.m. For more information call 507-437-6082. Hennepin History Museum, Minneapolis MN, hosts hosts a celebration and exhibition of student History Day medalists from Hennepin County, September 28, 2014, 1-3 p.m. For more information call 612-870-1329. St. John’s Cemetery will host a cemetery walk in commemoration of its 150th anniversary on Sunday September 28, 2014, from 2-5 p.m. Living history players will depict Red Wing citizens and Civil War re-enactors will drill on the hour. St. John’s Cemetery is located on Old West Main just west of the Cannon Valley Trail parking lot. Free to the public. Email Michelle Engel for more information. Stearns History Museum, St Cloud MN, and the Department of History at St. Cloud State University, will present a free program on Minnesota history by historian Dr. William Lass who will talk about his new book entitled "Shaping the North Star State: A History of Minnesota’s Boundaries," Tuesday September 30, 2014 at 7 p.m. For more information call 320-253-8424. Join Anoka County Historical Society, Anoka MN, for the continuation of their monthly Civil War lecture series. These lectures focus on a variety of Civil War topics and are free to the public. Sherburne History Center, Becker MN, Book Club will meet on Thursday October 2, 2014 at 6:30 p.m. The October selection is Sweet Land by Will Weaver. Scott County Historical Society, Shakopee MN, is holding its Pints & Plates Fundraiser, Thursday October 2, 2014, 7 to 10 p.m. at Turtle's 1890 Social Centre. Anoka County Historical Society hosts its annual Monuments to Life cemetery tours, Thursdays, Fridays, & Saturdays, October 2, 3, 4, 9, 10, 11, 16, 17, 18, 23, 24, 25 and Halloween week October 26, 27, 28. NWA History Centre, Bloomington MN, would like to bring to everyone's attention the Annual National WWII Glider Pilots Reunion, Friday October 3, 2014 from noon to 4 p.m. at the Golden Wings Museum, Anoka County/Blaine Airport (Janes Field). Free to the public. Minneapolis Central Library, Minneapolis MN, hosts Phil Anderson who will talk about 100 Years of South Minneapolis bakeries, Saturday October 4, 2014 1–2:30 p.m. Free to the public. Carver County Historical Society, Waconia MN, announces a talk on The Sea Wing Disaster: Tragedy on Lake Pepin, with a brief discussion on The Big Water: Lake Minnetonka and Its Place in Minnesota History, Saturday October 4, 2014, 10 a.m. to 12 p.m. For more information call 952-442-4234. Free to the public. Pond Dakota Mission Park, Bloomington MN, invites you to watch a demonstration of Native beading by Lakota artist and St. Paul resident Carol Charging Thunder, then make your own bead project to take home. Sunday October 5, 2014, 2 to 4 p.m. For more information call 952-563-8693. Stearns History Museum, St. Cloud MN, hosts project director and video producer Randy Croce who will present his documentary video "Who Built Our Capitol?" Wednesday October 8, 2014 9 a.m. For more information call 320-253-8424. St. Louis County Historical Society and the Italian American Club of Duluth invite the public to learn about Italian history while eating an Italian Dinner, Thursday, October 16, 2014, 6 to 9 p.m. For more information call 218-733-7586. Carver County Historical Society, Waconia MN, will be going over the basics of quilting. Start stitching your own quilt now, October 16 and 17, 2014, 12 to 4 p.m. For more information call (952) 442-4234. Free to the public. Hennepin History Museum, Minneapolis MN, hosts a presentation on “Axel & Carmen Fan Club,” Monday October 26, 2014, 2 p.m. For more information call 612-870-1329. Join the Hennepin County Library Special Collections and the Twin Cities Archives Round Table (TCART) on Friday October 24, 2014 for the third annual Minnesota Archives Symposium. This year's theme is "Inviting Interaction: Building Digital Access and Connections in Archives & Special Collections." Registration is FREE. For more information call 612-543-8203. Wood Lake Battlefield Annual Symposium will be held Saturday September 27, 2014. Please RSVP if you plan to attend. There is no cost, but attendees will pay for their own lunch. The Mississippi River Parkway Commission (MRPC) of MN was selected as the recipient of the 2014 MRPC Pilot’s Award, presented annually to a state commission in recognition of outstanding achievements in pursuing the goals and objective of the MRPC. The award was presented on Friday evening at the MRPC Annual Meeting in Memphis TN and was accepted by Karl Samp along with Nancy Salminen and Carol Zoff on behalf of the MN-MRPC. MRPC Pilot Bob Miller mentioned the Corridor Management Plan project as one of the reasons Minnesota was selected for this recognition. National Endowment for the Humanities' Sustaining Cultural Heritage Collections grants encourage sustainable approaches to preserving humanities collections. Grant deadline: December 3, 2014. No one submitted fabulous photos of the American Association for State and Local History conference last week--apparently what happens at AASLH stays at AASLH. Thanks to all the attendees for making this conference a successful one! See you next year in Louisville. American Association for State and Local History (AASLH) will present its 2015 annual meeting in Louisville KY, September 16-20, 2014 and is seeking session proposals for the meeting. Engaging Young Children in Museums, by Sharon E Shaffer.